The stairway begins in the wide hall and leads up to a loft bedroom. There is a low wall at the stairs can be used to open into the vaulted ceiling above the parlor. A closet and a full bath with a small window complete the loft bedroom #2. 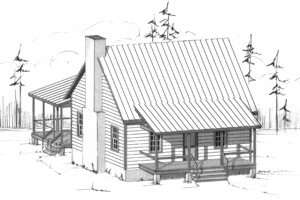 Of course, the long country front porch makes this home a ‘Cozy Country Cabin.’ When the family grows, it would be easy to add a third bedroom within the vaulted area. This cozy Cabin with an “eat-in kitchen’ provides ample cabinets. Note the long counter space next to the sink. Both the parlor and the breakfast area open with French doors to a large screen porch. 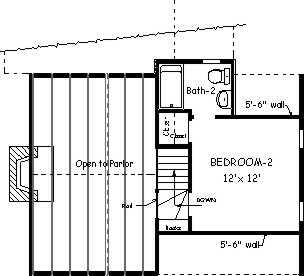 Bedroom 1 with its ample wall space is conveniently located next to the hall bath. Washer and dryer are hidden behind bi-fold doors. The vaulted ceiling enhances the parlor and emphasizes the tall masonry fireplace. The stairway begins in the wide hall and leads up to a Loft Bedroom. Low wall at the stairs can be used to open into the vaulted ceiling above the parlor. 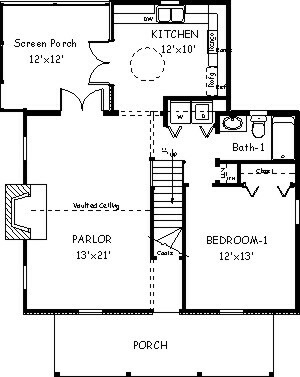 A closet and a full bath with a small window complete the Loft Bedroom 2. Of course, the long country front porch makes this home a ‘Cozy Country Cabin.’ Owner could add a third bedroom within the vaulted area.